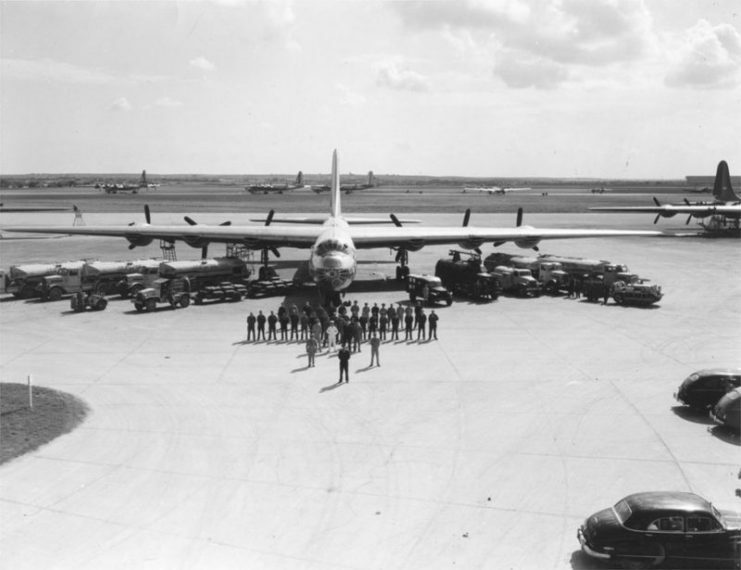 The Convair B-36 was a US intercontinental strategic bomber that had the unofficial name “Peacemaker.” In the entire history of aviation, it is the largest combat aircraft in regard to height and wingspan. After the appearance of the B-36, the concept of global nuclear war entered into the lives of many people. At the same time, politicians realized that there were no winners in a nuclear war. The presence of such an aircraft in military service served as a notification to the Soviets of the air superiority held by the US. The B-36 was the first bomber in the world that had the technical capabilities for intercontinental flight. On April 11, 1941, the US Army Air Corps (USAAC) made a request for an intercontinental bomber. However, the initial request for a top speed of 450 mph (720 km/h), a service ceiling of 45,000 feet (14,000 meters), a maximum range of 12,000 miles (19,000 km), turned out to be too demanding and exceeded the technological capabilities of the time. For this reason, on August 19, 1941, USAAC reduced the requirements to a maximum range of 10,000 miles (16,000 km), an effective combat radius of 4,000 miles (6,400 km) with a bombload of 10,000 pounds (4,500 kg), cruising speed between 240 and 300 miles per hour (390-480 km/h) and a service ceiling of 40,000 feet (12,000 m). 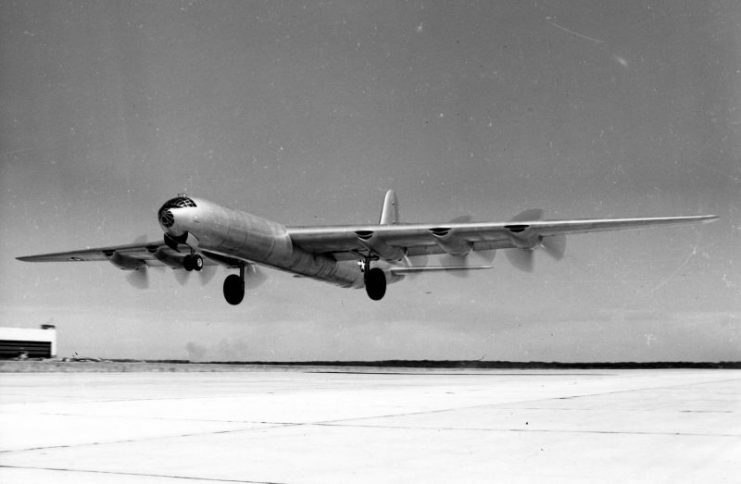 The serial production of the Convair B-36 significantly exceeded the initial order for 100 aircraft, and lasted until August 14, 1954. A total of 384 bombers with various modifications and assignments were created. 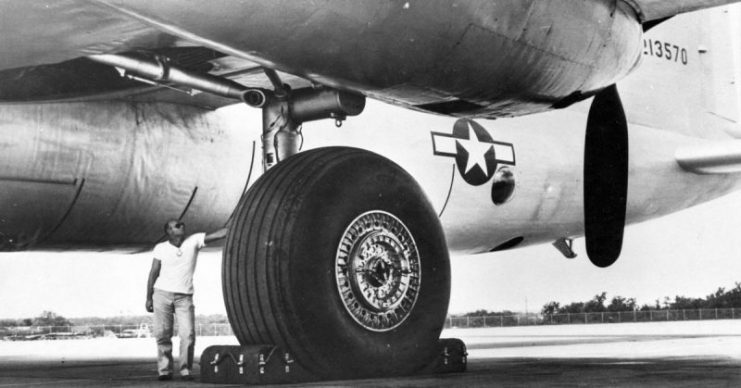 On all the bombers starting with the Convair B-36D model, four additional J47-GE-19 jet engines were installed. For this reason, the B-36 is on the record as an airplane with 10 engines consisting of two different types. The Convair RB-36D is the jet-augmented version of the intercontinental strategic bomber. Its jet engines were used only in two phases of flight: during take-off and while climbing, and to gain additional height and acceleration over a target. For most of a flight, these engines remained inactive, which created the threat of icing. To counter this, the B-36’s designers refined the anti-icing system of jet engines by connecting the heating of the pylon and the engines to the general heating system of the aircraft. B-36 Pacemaker – personnel and equipment. The crew of the B-36 consisted of 15 people. For defense, the bomber had 6 remote-controlled retractable launch gun turrets, 16 nose turrets, and a fixed tail turret, all equipped with 20-mm cannons. However, vibrations while shooting often caused the electronic vacuum tube to malfunction, and the navigation and aircraft controls to fail. 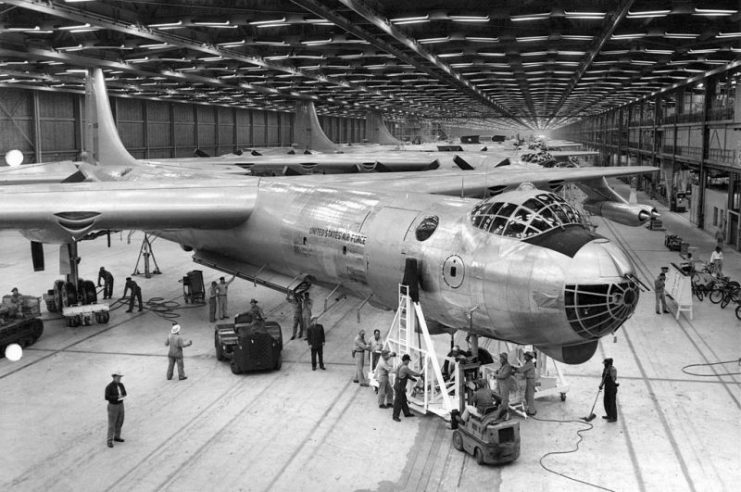 RB-36Ds in Convairs Aircraft plant. 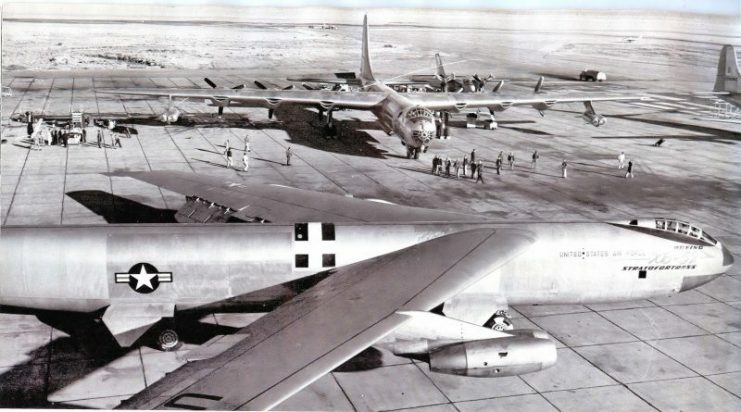 After the appearance of serial models of the B-52 by the end of the 1950s, the relevance of the B-36 bomber was in doubt. Soon, all these aircraft were decommissioned by the US Air Force. This decision was further driven by the low reliability and time-consuming process of servicing piston engines in comparison with gas turbine engines. 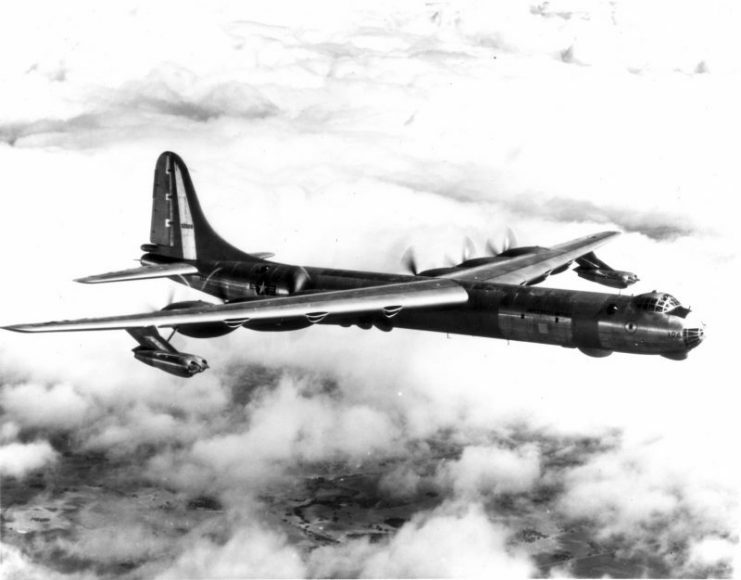 11th Bombardment Wing Convair B-36J-5-CF Peacemaker (52-2225), 1955. 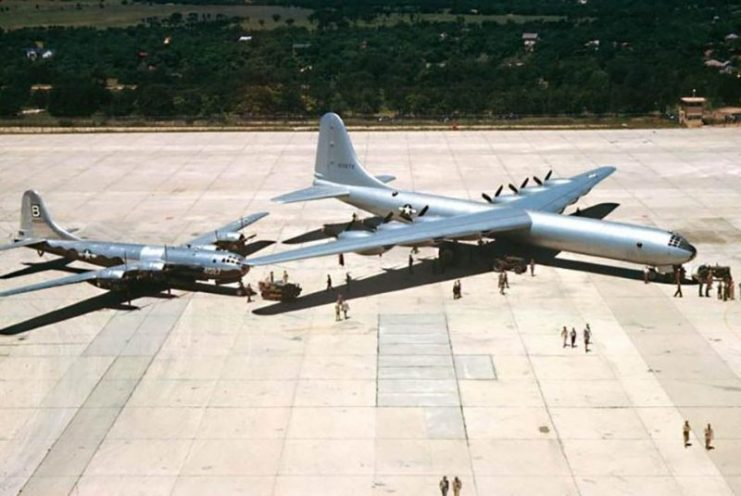 It is worth noting that the B-36 is connected with an incident that could have resulted in a full-fledged nuclear catastrophe. On May 22, 1957, the B-36 transported a thermonuclear bomb from Biggs Army Airfield in New Mexico to Kirtland Air Force Base. When approaching the destination, the bomb dropped out of the bomber. The thermonuclear projectile fell to the ground over 1,600 feet away from the nuclear weapons depot and 4.3 miles from the airbase control tower. The bomb detonated upon hitting the ground, which in normal conditions would have initiated the detonation of the plutonium nucleus. However, a nuclear explosion did not occur, and a crater with a diameter of 25 feet and a depth of 12 feet was formed at the site of the fall. 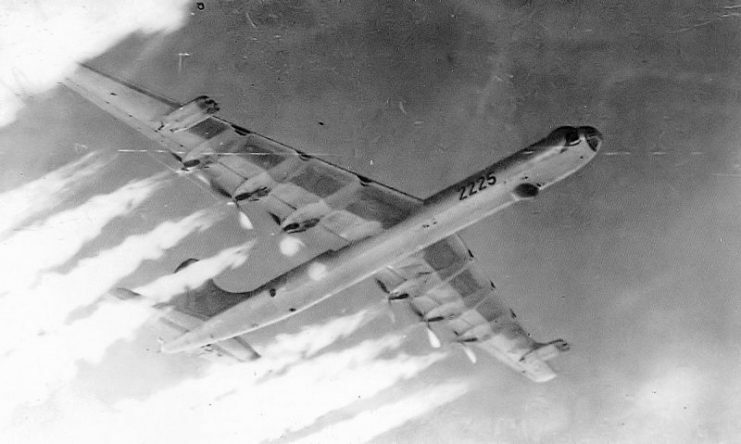 The B-36 never took part in actual combat. However, its RB-36 modification was widely used as a reconnaissance aircraft. Large dimensions allowed for the placing of high-resolution cameras on the plane. Its abilities to fly at great heights made the B-36 inaccessible to anti-aircraft artillery of the time. There is an assumption that in the 1950s, the B-36 made reconnaissance flights over the territory of China and the Soviet Union. Convair B-36s at AMARC 1958 awaiting scrapping. In addition, the B-36 was used in the program to create a nuclear-powered aircraft. Specially converted NB-36H aircraft, with a working nuclear reactor on board, made flights. The purpose of those flights was a scientific study of the effect of radioactive radiation on the crew and the various aircraft systems. However, work on the creation of nuclear-powered aircraft was not continued.